Hey guys, this is REALLY important. We must make a huge stink about this and not let it slip past unchallenged. Nunes, who was a member of Trump's transition team and is currently tasked with leading the supposedly impartial investigation into Russiagate, then rushed right back over to the White House to share that news with Trump and with reporters before even sharing it with the other members of his committee. His reasoning was that Trump's getting such a lot of bad coverage that this was the right thing to do! Top House Democrats are now calling for Nunes to recuse himself from the investigation which is a good start but not nearly enough. Nunes needs to be removed from the Intelligence committee and they must appoint a special prosecutor to run a thorough, impartial investigation. 1. Call your Representative. Find your Rep if you don't already have her or him in your phone. You may have to try several offices before you get through to a staffperson. When someone does pick up, say: "Hi, my name is ___ and I'm calling from ___ to urge Rep. ___ to demand that Rep. Devin Nunes not only recuse himself but that he also be removed from the House Intelligence Committee and that a special prosecutor is appointed to lead a thorough, unbiased investigation into President Trump and his campaign staff's potential ties to Russia. His recent actions clearly show that he is incapable of being unbiased and nonpartisan." Then thank them for taking your call. Always be polite even as our democracy crumbles around you. 2. Email your Representative. Submit a comment through your Rep's website comment form. You're welcome to adapt mine below. I'm writing to urge you to demand that your colleague, Rep. Devin Nunes (R-CA) recuse himself from the investigation into President Trump's ties to Russia. Nunes' recent actions demonstrate that he is incapable of running an impartial, non-partisan investigation and the integrity of our democracy hangs in the balance. I also urge you to call for the appointment of a special prosecutor to perform a thorough, free and unbiased investigation into Trump and his campaign's potential ties to and collusion with Russia. 3. Call Paul Ryan. (202) 225-0600. Press 6 to leave a message. You don't get a lot of time so keep it brief. Just say this. "My name is ___ and I'm calling from ___ to urge you to remove Rep. Nunes from the House Intelligence Committee and appoint a special prosecutor to investigate President Trump's ties to Russia." Then press 1 to approve your message and press 1 again to send your message. You're welcome to recycle or retweet any of the tweets below. 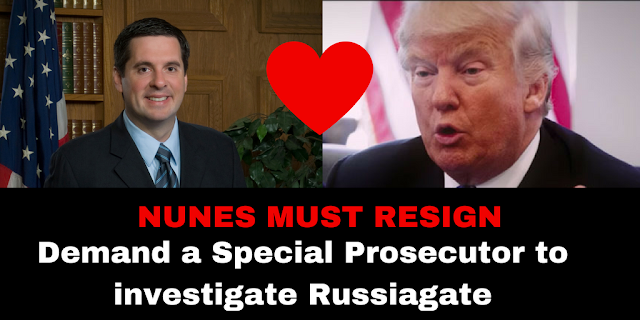 @DevinNunes should resign immediately. @SpeakerRyan must appoint a special prosecutor or you, too, will be complicit in #russiagate scandal. @HouseGOP must remove @DevinNunes & appoint a special prosecutor to investigate Russia ties or risk being complicit in whatever is found. 5. Share this with 5 other people via email or social media.